Author Michael Dregni’s definitive Django biography traces the roots of the gypsy’s music, the sources of his inspiration, his influence on succeeding generations and his unusual relationship with the Third Reich. 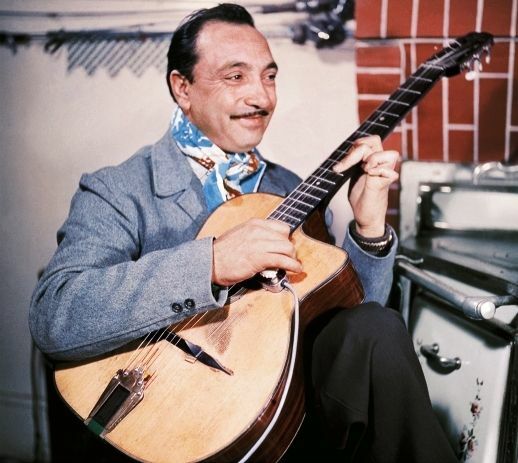 Django Reinhardt was arguably the greatest guitarist who ever lived, an important influence on Les Paul, Charlie Christian, B.B. King, Jerry Garcia, Chet Atkins, and many others. Handsome, charismatic, childlike, and unpredictable, Reinhardt was a character out of a picaresque novel. Born in a gypsy caravan at a crossroads in Belgium, he was almost killed in a freak fire that burned half of his body and left his left hand twisted into a claw. But with this maimed left hand flying over the frets and his right hand plucking at dizzying speed, Django became Europe's most famous jazz musician, commanding exorbitant fees—and spending the money as fast as he made it. In Django: The Life and Music of a Gypsy Legend, Michael Dregni chronicles Reinhardt's remarkably colorful life—including a fascinating account of gypsy culture—and sheds much light on Django's musicianship. He examines his long musical partnership with violinist Stephane Grappell— the one suave and smooth, the other sharper and more dissonant—and he traces the evolution of their novel string jazz ensemble, Quintette du Hot Club de France. In this March 9, 2005 interview with Jerry Jazz Musician (www.jerryjazzmusician.com), Dregni talks about the life of the acknowledged jazz master, and the extraordinary times and circumstances in which he lived. 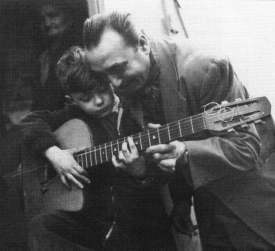 What initiated your interest in Django Reinhardt's work? Michael Dregni: The interesting thing about Django is that he not only draws jazz fans, but he draws guitar fans from all genres of music as well. Even more than his jazz background, this interest has kept his music alive for the past thirty or so years. People like Chet Atkins and David Grisman, who plays in a bluegrass style, are among those who were fascinated by Django. As for myself, I was interested in Mississippi Delta blues, and I read somewhere that B.B. King was a big fan of Django's, and that he used to play his records on his Memphis radio show in the fifties. That made me interested in pursuing more information about him. I learned he was a Gypsy, which is associated with such a romantic culture, and it made me want to seek out his music. The wonderful Gypsy arpeggios really drew me in—I loved them right away. I began collecting his music and tried to learn how to play it, but in addition to his music, I discovered that Django learned how to write a little bit, and to improvise his spelling much as he improvised jazz. During his 1946 tour of America with Duke Ellington he wrote a letter home from Minneapolis, which is my hometown, and this brought all my interest in him home. I was fascinated with the idea that he was here, in Minneapolis. That visit is what really inspired me to start researching his life, and things just snowballed from there. How were Gypsies viewed among the residents of Paris during the era of Django's youth? MD: Probably much as they are today. Gypsies are outsiders. It was difficult tracking down some of the Gypsy guitarists for interviews—you don't find them listed in the phone book. From the accounts I have heard, Django had a difficult time even getting a gig because cabaret owners were afraid he would steal the silverware. Being a Gypsy put him in the third layer down in French society, beneath the French and the African Americans coming to play jazz. Gypsies were really down in the basement. Did he have any sort of formal education? MD: His family spent their winters in Belgium, and his mother tried to get him into school there now and then. There is an old myth that Django only spent one day in school, although he certainly spent more than that. In addition to being in and out of school in Belgium, a traveling school in Paris came out to the slums—"la Zone," a no-man's land beyond the city's old medieval fortifications where the Gypsies lived. A schoolteacher converted an old bus into this traveling school, in which Django purportedly attended class. It is difficult to gauge how much education he had. He didn't learn to write until Stéphane Grappelli taught him, probably in the late 1930s, and I don't think he ever learned to read books or music. Django’s family was devoted to music, which spurred him on. He first played the violin and then the banjo around Gypsy campfires, learning these instruments from his father. You characterize the Gypsy culture as being closely knit, colorful, and very musical. MD: Yes, I think it was all of those things. There are certainly different tribes of Gypsies, and Django's was a musical tribe. In an effort to survive, other tribes devoted themselves to mending pots, weaving baskets, trading horses, or fortune telling, but Django's family really seemed to devote itself to music, which is what spurred him on. He first played the violin and then the banjo around Gypsy campfires, learning these instruments from his father. His father had seven brothers who were all musicians as well, and Django grew up among this. MD: A couple of the accordionists who played with him talk about Django as a young prodigy, and how they would struggle to keep up with him even though they were the leaders and he was the accompanist. I just love that image of him. One of the musette performers, Jean Vaissade, said, "He stuck his fingers to his nose and played incredible, complicated things the other banjo players that worked with us could not have even imagined. Although he was our accompanist, it was we who were unable to follow him! He played almost too strongly and, deep down, we were always afraid that he would overshadow our accordions!" MD: Yes, and if you hear Django in some of those early recordings with Vaissade, it sounds like a duel. Django was always so forceful in his playing, and he was really pushing the beat along. An example of French musette music, all the rage in Django’s youth. Musette grew out of a mix of provincial French bagpipes, Italian accordion, and Gypsy banjos, and is described by Django biographer Michael Degni at “down home, good time music,” akin to American country music. This song, ‘La Sorciere,’ is played by the Seattle cabaret ensemble, Rouge. What sort of culture did musette spawn in terms of fashion and nightlife? MD: Musette was one of the real discoveries for me while writing the book. The original chapter on musette was about three times longer, but I had to slice it back because I was feeding it all this detail on the culture and the fashion. Musette basically grew out of a mix of provincial French bagpipes, Italian accordion, and Gypsy banjos, so it was a funny place to start. It continues even now in parts of France, and in a way you can sort of compare it to country western music in the United States—it is down home, good time music. And just as there are country western or roadhouse bars here, there are those kinds of venues in France around musette as well. Where was musette primarily performed? MD: In the dancehalls of France, known as bals musette. Did Django fit into this musette culture pretty comfortably? MD: I don't know if I can say. He played in that world when he was twelve to eighteen years old, which were six formative years for him. There is little known about him during that time period other than that he moved around from band to band, making a good number of recordings, so he must have fit into it pretty well. An ongoing theme in this book is that he was pretty unreliable in terms of showing up for gigs, a trait of his that began at a pretty early age. MD: Yes, it did, and I have always been curious about that. It could be that he was indeed simply unreliable; it could be that he only played when the spirit moved him; or it could have been something deeper in the Gypsy culture—a sharing of the wealth, for example. It is possible that Django told his brother or another Gypsy cousin to play in his place so that they too would have the opportunity to make an income from the work. It is difficult to say, but he certainly had that reputation of being unreliable throughout his career. MD: That's right. Django wasn't the only jazz musician in history to have missed a gig. It was interesting to read how he used to transport his guitar and banjo wrapped in newspaper. It reminded me of how Bix Beiderbecke carried his trumpet around in a paper bag. MD: Even in Django's later years, well after he became a success, people describe his guitar as being incredibly battered, and that he would use a match to hold the bridge up to the proper height. It didn't seem that having a gorgeous guitar was a primary concern to him. You wrote, "From the time Django first heard Billy Arnold, jazz filled his imagination. The music was not only exotic and new but also represented freedom to Django. It left behind the strict traditions of musette for new rhythms and opportunities to play the sounds he heard in his head. Django built up a small repertoire of American jazz numbers, playing the melodies by memory." What were the first jazz songs he played? MD: I don't know that I can say for sure. My statement you quote from was taken from the descriptions of that era by Charles Delaunay and Django's bass player, Louis Vola, and they never mentioned particular songs. 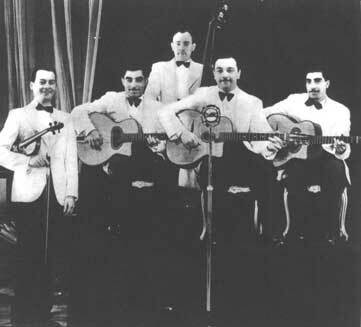 It was not until later, when Django began playing with Grappelli even before the Quintette du Hot Club de France was formed, that they talk about particular early songs like "I Saw Stars," "Dinah" and "Lady Be Good," all of which were a part of his repertoire for at least the first decade of his career. Even later they would return to those songs. So as far as I know, they are some of the earliest jazz pieces he played. How did Jack Hylton want to use Django in his orchestra? MD: Jack Hylton led a traveling big band that already included a guitarist, Noel "Chappie" d'Amato, who played a number of instruments. According to all of the accounts I found, Hylton wanted to hire Django to play in that main traveling band. It is possible that since Hylton also had secondary bands—kind of like "farm league" bands that traveled around England—he may have envisioned having Django play in one of those bands and work his way up. Hylton was like the Paul Whiteman of England? MD: Yes, he was a big name in England all the way through the fifties, when he switched over to producing television shows. Within a night or so of being hired by Hylton, a fire in Django's caravan ended that opportunity and damn near his career as a musician. MD: Yes, that's right. As far as I can tell, the hiring was verbal. The Jack Hylton Archives didn't have any record of a contract with Django, which, according to Hylton's biographer, was pretty typical of Hylton. Most all of his business deals were verbal, made with a shake of the hand. So from all the accounts I researched, Hylton and Django made their deal to work together, and it was either that night or several nights later that the caravan fire occurred. In the fire, his left hand was burned badly, and the right side of his body was affected to the point where they actually talked about amputating his right leg. MD: He apparently had burns over most of the right side of his body, as well as his left hand. It's possible that he put a blanket up to shield himself as he tried to put the fire out, and at that point burned his hand. I never read accounts of him ever having trouble walking or anything like that, but in the pictures William Gottlieb took of him in 1946, the scar the fire left on his hand is visible. As a guitarist yourself, can you imagine how difficult it must have been to play the instrument with a hand as impaired as Django's? MD: Well, I certainly couldn't play the guitar with two fingers. 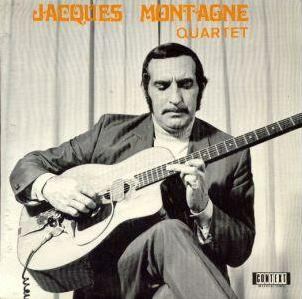 Amazingly, several of the Gypsy guitarists who came along after Django played with just two fingers in an effort to get the tone he had—guitarists like Jacques Montagne. Even today, players like John Jorgenson or Sam Miltich here in Minnesota will every now and then play a song with two fingers for fun, and they are able to do it, but four fingers is certainly better. How long did it take for Django to learn how to play the instrument using two fingers? MD: He was convalescing and teaching himself to play again for about eighteen months. What did he do to earn an income during this time? MD: I am not sure. He must have been eighteen or nineteen years old, and during part of that time he was in the free hospital for the poor of Paris, and most likely living with his mother in their caravan for the other part. She made jewelry and sold homemade lace, and was probably able to provide enough of an income for them. It is also possible that his brother Joseph was playing music around town to earn money. It isn't likely that they needed a huge income in that caravan, and I think that is one reason Django was able to stay with music through the ups and downs of the years, whereas many of the Frenchmen who played in his band would have to leave because they weren't making enough money to support themselves. You describe Django's first listening of Louis Armstrong's "Indian Cradle Song" as a turning point in his life. Can you talk a little bit about that? MD: That is a first hand description from Emile Savitry, an amateur guitarist, painter, and all-around bohemian who played the record for him. Savitry heard Django and his brother play in Toulon in the south of France, was impressed by their music, and invited them up to his apartment to play some new American jazz recordings, including some by Duke Ellington, Joe Venuti and Eddie Lang, as well as this one by Armstrong. According to Savitry's account, Django heard this and broke down, holding his head in his hands and exclaiming in the Romani language, "Ach moune," which means, "My brother." While it is an exclamation, in this case it had a secondary, ironic meaning. Savitry said, "Right away, he understood Armstrong. Right away, he preferred Armstrong's formidable playing over the erudite technique of the orchestra of Duke Ellington. Guided by an instinct of astounding precision, he was able to judge these musicians, almost instantly." MD: Yes, and many times that has been projected as a kind of "Eureka!" moment for Django, but it is important to remember that he had heard jazz before—he had heard Billy Arnold, and he liked what he had heard of other people like Mitchell's Jazz Kings playing in Paris, for example. But that was music from the mid-twenties, and jazz had taken these giant steps forward to Louis Armstrong's playing, so while it was a "Eureka!" moment of sorts, he had indeed heard jazz before hearing "Indian Cradle Song." 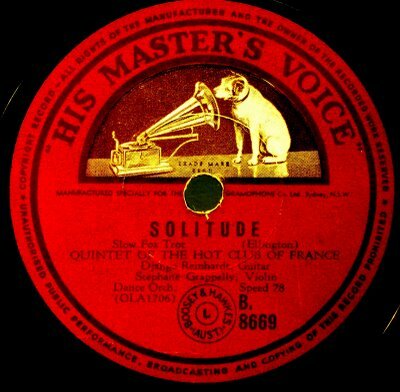 How was the groundwork for the Quintette du Hot Club de France laid? MD: The Quintette happened by accident. Django was playing with Stéphane Grappelli in a fourteen-piece orchestra for tea dances at the Hotel Claridge on the Champs-Élysées. It was a kind of stilted affair that included waltzing, and Django's dance band alternated with a tango band. Grappelli actually played in both of these bands. At one point he broke a string on his violin and stepped backstage to restring and tune up. As he was tuning up, he played a little jazz ditty that Django echoed, and they began jamming together. The next thing they knew they had a rhythm guitarist joining in, and a bass player, and the band built up by accident from this experience. MD: The Hot Club was not a place, although many people have that idea. It was more like a fan club of young jazz buffs who published a newsletter and sponsored concerts in a record store in Montparnasse. It wasn't until later, in the late thirties, that they actually had a headquarters, a clubhouse. In their early years together, the Quintette played a little bit here and there throughout Paris, but they primarily lived as a recording band, and it wasn't until about 1936 or 1937 that they had steady gigs that kept them together as a band. In those early years they would pull each other out of other bands they were playing in to make their recordings. Charles Delaunay and Hughes Panassié were the originators of the Hot Club? MD: Yes. Delaunay actually came a little bit later, but he was eventually instrumental in it. Along with a small group of eighteen-year-old jazz fans who started this group, Panassié was really the driving force behind the Quintette for many years. They organized concerts and recording sessions for them. Finding them recording sessions wasn't particularly easy. After an audition for the record label Odéon, the label's directors informed the Quintette, "After deliberation, our administrative committee has found that your band is far too modernistique for our firm." MD: During that time, jazz was having a hard time gaining acceptance, so they had some difficulties getting recorded for a couple of years. And once jazz did gain appeal, it was considered to be horn music, drum music, or piano music. So when Django and Grappelli came along, recreating the music people were used to hearing come out of Louis Armstrong's trumpet—only on strings—it was an odd thing to accept at the time. Was Django generally appreciated by members of the Hot Club? MD: While he was certainly appreciated, he was also considered to be a bit of a novelty because he was a guitarist, which was not a solo instrument in those days. Some said that he didn't know much about jazz in those early days, but they did hear something special in his playing. The members of the Hot Club wanted to find Frenchmen they could support so they could prove to others that the French could play jazz as well as the Americans, and in Grappelli and Django, they believe they found that. Of the recording of "Dinah," you wrote, "Django's playing gave sound to the spirit of Jazz Age Paris. His lines of acoustic guitar notes were pure rapture, effervescent and evanescent, floating away with an unbearable lightness and transience of the moment, their fleeting beauty almost unbelievable. The genius of all his future music was in embryo in that one solo." Was that his very first recording session with the Quintette? MD: He had recorded musette as well as some auditions that hadn't been released, but this was his first commercial recording session with the Quintette. It is fascinating because at the time, recording was really a black art—they put one microphone in the center of the musicians and when it was time for a solo they had to step forward and hope they got the sound balance right. Some of the Hot Club impresarios described how the recording engineers were concerned that the musicians didn't know how to play the melody "right," when in fact what they were doing was improvising. The engineers didn't understand this—they thought they were playing out of tune. At the conclusion of the first recording of "Dinah," Django was so thrilled with his improvisations that he bumped his guitar against his chair as he finished his song, and this ugly noise was recorded, which appears at the end of the piece. The engineers wanted to throw the whole thing out and start over, but the Hot Club impresarios were quite happy with the improvisation—which was what mattered most to them—and convinced the engineers to keep this recording that eventually became so famous. How soon was this particular recording available in the United States? MD: I am not sure. It was released only in France at the time, and I don't know when it was first licensed for export into the United States. You wrote, "For the French—whether they simply sought to dance to jazz or were true disciples such as the Hot Club members—a band made up of Gypsy guitarists and Frenchmen was not the real thing." In 1936, Paris passed a municipal law limiting the number of foreign musicians in a band to thirty percent of the French musicians because the numbers were so overpowering in favor of non-French. Did this law have a positive impact on the Quintette's ability to find an audience? MD: What is important to realize is that in Paris during this time, African American expatriates were placed on a pedestal because they supposedly had jazz in their blood, while French musicians who could play jazz—Django and his fellow Gypsies among them—were disregarded because they weren't black. So the law you are referring to was important in that sense. In the early years of World War II, many of the African Americans left for home, and cabaret owners turned to the Frenchmen to play in their place. While it is difficult to say how it affected the Quintette's ability to get gigs, there is no doubt that the mood of the times was that people preferred hearing African Americans play jazz over Gypsies or Frenchmen. 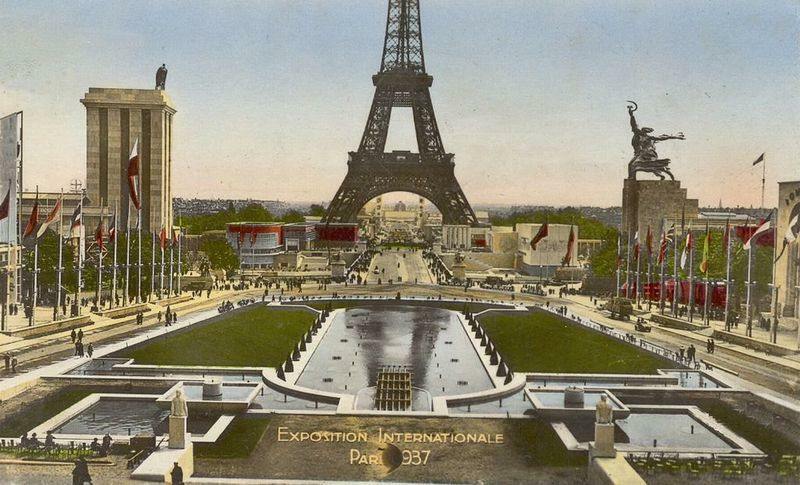 The Paris World Fair of 1937 (officially International Exposition dedicted to Art and Technology in Modern Life). ‘There was an explosion of art, literature, music, and theater that may have been unrivaled in any period before. It was the time of Picasso, Modigliani, and all the great modern artists; of James Joyce and Ernest Hemingway; and of the night clubs of Montmartre, Pigalle, Montparnasse, and along the Champs-Élysées that featured jazz bands and theatrical performances starring the likes of Josephine Baker in grand music hall productions,’ says Reinhardt biographer Michael Dregni. MD: There was an explosion of art, literature, music, and theater that may have been unrivaled in any period before. It was the time of Picasso, Modigliani, and all the great modern artists; of James Joyce and Ernest Hemingway; and of the night clubs of Montmartre, Pigalle, Montparnasse, and along the Champs-Élysées that featured jazz bands and theatrical performances starring the likes of Josephine Baker in grand music hall productions. It had to be an incredibly exciting time. At the same time, the United States was in the last years of prohibition, the Great Depression was still going on—it was starting to affect Europe as well—and jazz was this lively, happy music that provided an antidote to the times. You wrote, "For Django and for jazz, World War II was the best of times and the worst of times." He flourished during the war while many of his fellow gypsies were being murdered by the Nazis. How did he come to terms with that? MD: The chapter in my book devoted to his war years probably uncovered the most new material about him, because so little had been known about those years—and a lot still remains unknown. I don't have a sense of how Django felt about it all, and there has been a question about whether or not he was a Nazi collaborator. Simply put, he had to play his guitar and perform his music to stay alive, as did other artists like Edith Piaf and Maurce Chevalier. 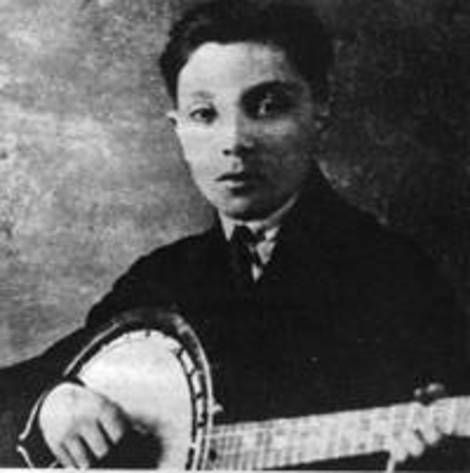 If Django hadn't played his guitar, he would have been just another Gypsy to be rounded up and sent to Auschwitz. Right. It is hard to blame him for that. Of Nazi propaganda minister Josef Goebbels you wrote, "Goebbels knew the power of music...As self-proclaimed arbiter of culture, Goebbels was quick to vilify swing: He denounced it as niggerjazz, jazzbazillus, cultural bolshevism, and modernism...Goebbels feared jazz and its potency. Jazz made people dance, not goose-step; laugh, not salute; sing, not hail Hitler. It was an ideological challenge to fascism, the antithesis of everything Nazism stood for." What steps did Goebbels take to deal with the jazz that was so popular in France? MD: Throughout the Third Reich, he banned the importation and the playing of American jazz recordings—and of American recordings of any sort—and he was controlling over the types of jazz or dance music that were being played. Part of the whole paradox of that time is that he never truly banned jazz outright because it was popular with the German people, the German soldiers, and the Nazi high command. Jazz was a popular music of the time, and they wanted to listen to it on their radios and they wanted to go out and dance to it as much as the French or American jazz fans did. So, while Goebbels never banned it outright, he did work to control it. He banned certain songs, he banned all of the American recordings, and he also put the Nazi seal of approval on certain bands that were allowed to record in Germany and other parts of Europe under Nazi control—Jack Hylton's being one of them. And in a way, Django was approved as well. Concerning their hatred of American jazz, you use a quote in your book that is attributed to the Gestapo; "Anything that starts with Ellington ends with an assassination attempt on the Fuhrer!" MD: Yes, that is quite revealing, isn't it? That is a book in itself, right there. There was a young, spirited, and vocal group of French jazz fans known as les zazous. How did the occupying Germans and the Vichy government view these fans? MD: You can easily see parallels between the emergence of jazz in France during this time and that of rock and roll in America two decades later. In both cases, the older generation tried to put a stop to the developing interest among the teenagers. There was a flourishing teenage rebellion going on during the war, and it wasn't just happening in France, it also happened in Belgium and in some places in Germany. The occupying Germans and the Vichy ministers were outraged by these boisterous young fans, who grew their hair over their collars and even puffed it up in a pompadour, wore baggy pants and long suits and generally colorful clothing. Fascist collaborator groups would try to intimidate les zazous by trapping them and publicly shaving their heads. This culture was spawned, in large part, because it was so frowned upon by its elders. To many in Europe, jazz was a scourge, but to les zazous, jazz was freedom. Of Django's piece "Nuages," you wrote, "'Nuages' struck a chord throughout France. This soft, bittersweet tune was easy to whistle, speaking to Parisians in these gray days of ration cards, curfews, and blackouts. The melody was laconic, at once sad and mournful, yet also evoking a dreamy nostalgia for the way things were, a mnemonic password inspiring a remembrance of things past as real as Proust's madeleine." What affect did this piece have on wartime France? MD: The French national anthem—"La Marseillaise"—was of course banned by the Germans. Then along came this song by Django, which is really an antithesis of an anthem—it is not rousing, patriotic music normally associated with anthems. Instead, "Nuages" is a melancholy, bittersweet song that is filled with a nostalgic tone the people of Paris responded to. It became the stand-in for their national anthem. When Django first performed this song in concert in 1940, the audience went crazy. When he finished, he started playing another song but the crowd stopped him and made him play it over and over. It became his best-selling record of all time. How did the liberation affect his economic opportunities? MD: Both for the good and for the bad. His main opportunity after the war was playing for the American GI's in the clubs of Paris, as well as in their Army camps in the south of France, where most of them were located. But because the French economy took so long to recover after the war, there weren't the steady gigs he had before the war, so it was really an up and down time for him economically. At times I think he became a little discouraged, and near the end of his life basically retired from the jazz scene, partly because of his disillusionment with not having enough work. He felt his post-war destiny was in America, and came here at the invitation of Duke Ellington. MD: Charles Delaunay, who wrote Django's first biography, called the American tour a failure. He had his reasons for calling it that, partly because he was left out of organizing it and being part of it, but also because it was such a bittersweet experience for Django. 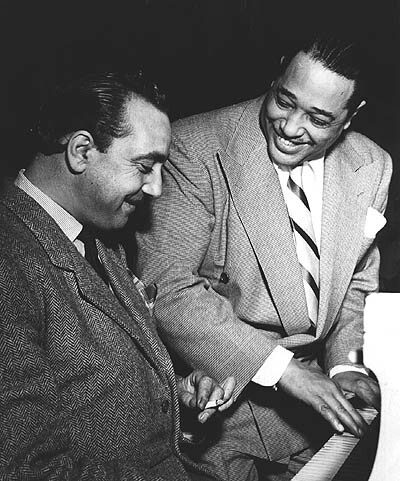 While on the one hand he had great success with Ellington's orchestra, on the other he had these naïve dreams of becoming a movie star and of recording with all the different American jazz stars—dreams that didn't come true during the three months he was in the United States. America with him, but Django accepted the invitation for himself only. MD: That's right. As far as I can ascertain from the different accounts, it looks as if Ellington invited the entire band, but Django basically accepted the invitation for himself. Did Django have any influence over how guitars were being manufactured? MD: I don't think Django necessarily did on his own, but jazz certainly did. I am a guitar player and a great fan of the instrument, so I found this topic to be especially interesting. The Henri Selmer-Mario Maccaferri guitar was built using the construction techniques of a mandolin with steel strings, with pressure on the top that increases its volume and gave it a trebly tone. The first Selmers, in fact, which were released in England and then in France, were just called a "Modèle Concert" guitar, meaning it was simply a louder guitar. The jazz musicians grabbed onto this instrument because it cut through all the sound and fury of the horns in a jazz band, and Selmer later changed the name to the "Modèle Jazz." So that is how jazz had its influence on the instrument, and in a way you can say Django was part of the reason that change was made, but at the same time, guitars were being created in the United States quite differently. 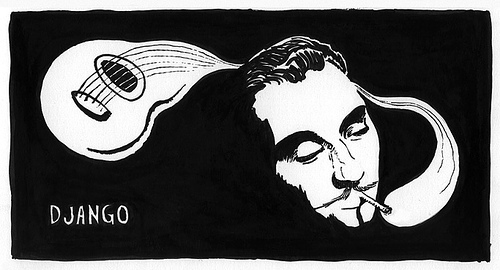 What are the five or six songs you would recommend to a new listener of Django Reinhardt? MD: I'll try to pick six songs summing up Django's career. From 1928 before the caravan fire forever changed his playing, "Ma Regulière," backing accordionist Jean Vaissade, shows his musette banjo playing; it's too bad no solo was recorded. The first Quintette recording of "Dinah" from December 1934 captures all of Django and Grappelli's future brilliance in embryo. "Bolero" from 1937 displays Django's development as a composer, blending elements of Maurice Ravel and Duke Ellington. Django also arranged the small-orchestra version, showing his power as an arranger. "Nuages" from 1940 is likely Django's most famous melody, one of the few songs by a European jazz musician to become a jazz standard. To summarize his bebop years, I think "Babik" from 1947—shortly after he returned from his American tour—is a fine example, named for Django's son. For the grand finale, I love his "Anouman" of 1953, a minimalistic cool jazz ballad that Django actually wrote for his saxman Hubert Fol to play; Django plays little on this piece, beyond the bridge. To those who have been previously introduced to his music, what are the hidden gems you recommend they go back and listen to? MD: There's a couple sessions that I love to listen to as they're kind of forgotten amidst all the other, more stellar ones. The session in Brussels from April 1942 with pianist Ivon de Bie where Django plays both violin and guitar in the same song is sublime. And I'm fascinated by his March 1941 session leading a big band in his Ellington-inspired symphonic compositions "Féerie" and "Nympheas." But my favorite session is the May 1947 one where he's trying his hand at bebop with an electric guitar; "Porto Cabello," "Duke and Dukie," "Babik," "Del Salle," and even "Song d'Automne" are just alive with great guitar. This session might not be classic Django, but I love it. After having written this book, what do you find yourself most fascinated with about Django? MD: Probably that he was able to create a method of jazz in four different jazz styles. He began playing traditional jazz during Louis Armstrong's era; became inspired by Benny Goodman and the whole swing movement, when he created his quintet with a clarinet and played swing; and then translated the bebop of Charlie Parker and Dizzy Gillespie into guitar; and finally, in his later years, after hearing Miles Davis's cool, minimalist jazz, in his final recordings you can hear Django moving in that direction, where he played fewer notes but with more eloquence. I don't think there are many jazz musicians, or many musicians in general, who transcend so many different genres of a style of music.